Since it was World Card Making Day last weekend, I spent some time making Thanksgiving cards for my sisters. I like to take the opportunity, during the holiday (and other times of the year too) to tell them how thankful I am to have them in my life. cute. love the calendar as a background panel. this is just so awesome! love the use of the calendar!! Love your felt and calendar accent! Love love love love this!!! BEAUTIFUL colors and loveeeeeeeeee that tree!!! Great card! I love that tree. Adorable! I'm loving me some JIllibean, perfect for fall! Love that tree! Cute card! Good for your, fun Thanksgiving Card. so sweet! - love the tree in the circle! Cute! That felt tree really makes the card! This turned out great. 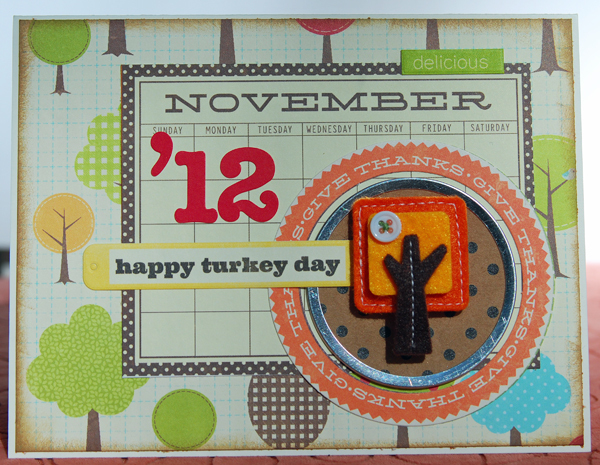 Love the use of the calendar and that cute felt tree!